"Descent (video game)" redirects here. For the 2019 game, see Descent (2019 video game). Descent is a 3D spacecraft-based first-person shooter video game developed by Parallax Software and released by Interplay in 1995. The game notably features six-degrees-of-freedom gameplay and was followed by several expansion packs, as well as a 1996 port to the PlayStation. Ports were also announced for the Sega Saturn and Panasonic M2, but these were later cancelled. The game has two direct sequels in the series: Descent II (1996) and Descent 3 (1999). The game is set out in the Solar System, where the player is cast as the Material Defender, a mercenary hired by the Post Terran Mining Corporation, or PTMC. On March 12, 2016, Matt Toschlog and Mike Kulas (designers of the original Descent games) successfully funded Overload on Kickstarter, describing it as a 'spiritual successor' to the Descent series; the game was released for computer platforms on May 31, 2018. On April 10, 2015, a prequel of the same name (titled Descent) was successfully funded on Kickstarter, raising over US$600,000 through crowdfunding. The expected release date of the prequel is 2019 on PC, Mac, Linux, Xbox One, and PlayStation 4. The game requires the player to pilot a spaceship through labyrinthine mines while fighting virus-infected robots, using the ship's armaments. The player is given the clear objective to find and destroy each mine's reactor core and escape before the mine is destroyed by the meltdown. For two levels (one for the shareware version), the reactor core is replaced with a boss, changing the objective that the player must destroy the boss in order to trigger the meltdown and escape before the mine blows up. To obtain access to the reactor, the player must collect the blue, yellow, and/or red access keys for each level, which are required to open doors. As an optional objective, the player can also choose to rescue PTMC workers who were taken hostage by the infected robots. Descent features a complementary points system. Players can score points by destroying enemy robots, picking up power-ups, and detonating the reactor. Bonus points are awarded upon completion of each level. These bonus points are based upon the player's shield and energy count, the skill level played, and a combination of picking up any hostages and safely rescuing them. Descent demands that players keep their sense of orientation in a fully 3D environment with a flight model featuring six degrees of freedom in zero-gravity. Traditional first-person shooter games require the player to only control two axes and their heading. By employing six degrees of movement, the player is given additional control for vertical movement and banking, introducing more movement controls than traditional FPS games. Descent's unique movement controls also increase the possibility for players to experience motion sickness or nausea – a common complaint found in reviews for the game. The player is given the choice to natively use a keyboard, mouse, joystick, or combinations of these devices. Use of a second input device with or without a keyboard provides a greater amount of control due to the additional degrees of movement. The game also supports the use of two independently configured joysticks. One of its many supported input methods was mouselook, which at the time had not yet become standard in first person games. The game provides a navigational wire frame map that displays any area of the mine visited or seen by the player, which revolves around the player's position. Use of the slide controls (commonly the joystick "Hat" switch) allows the player to navigate to areas of the map away from their current location. The use of wire-frame models meant that areas at varying distances would appear to mix together when overlapping. This was overcome in Descent 3 with the use of opaque wall brushes and lighting closely matching that found in-game. Additionally, Descent 3's map system allowed the player the ability to move the viewpoint through the tunnels in map mode. 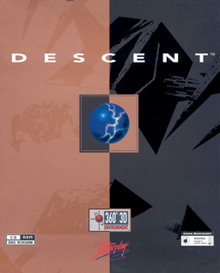 Descent features 30 levels, three of which are secret levels. Each level is based in a mine located in various locations in the Solar System. The shareware version comprises seven levels. In the full version, the player moves on through twenty more mines in an outward pattern from Earth. The player accesses the three secret levels located in the asteroid belt using alternative exit doors hidden in specific levels. The primary weapons in Descent use energy, with the exception of the Vulcan cannon, which uses traditional ammunition. The player's spacecraft has a maximum energy capacity of 200 units; energy is replenished from energy power-ups floating in the mines or ejected by destroyed enemies. Energy can also be topped up (to a maximum of 100 units) at "energy centers", permanent recharge locations. Descent uses shield power as health. As with energy, the ship "maxes out" at 200 shield units; unlike energy, shields can only be restored by acquiring "shield orb" power-ups. If the player finishes a level with shield power or energy power below 100 units, the ship will be recharged to 100 units for the next level. When the player's ship is destroyed, all acquired power-ups and weapons are strewn about the area as power-ups, any rescued hostages aboard are killed, and at a cost of a life, the player's ship is respawned at the original starting position. In multiplayer games, extra shield and energy pickups are also dropped upon death. Descent offers competitive multiplayer game play for up to eight players over a LAN and is touted as being one of the first games to allow initiating sessions conveniently from a menu within the game as well as on-the-fly joining of multiplayer games, whereas in many similar games of the era, it is presumed that all players have to be queued prior to initiating the match. The new version of Descent offers game play with considerably more players involved. Current versions allow up to 16 players. With the advent of Internet IPX clients like Kali and Kahn, Descent and Descent II were increasingly played over the Internet. Kahn, for example supported game matchmaking for internet-based gaming on MS-DOS, Windows 95 and Windows 98. Descent II was especially popular online due to its support for short packets and variable packet rate, which significantly improved quality of play over the slower Internet connections prevalent at the time. Since then, Descent source ports have added UDP support. The game begins with a briefing between a bald anonymous executive (in later games named Dravis) of the Post Terran Mining Corporation (PTMC) and the player, a "Material Defender" (revealed as MD1032 in the briefings, also using the callsign "Vertigo-1") hired on a mercenary basis to eliminate the threat of a mysterious computer virus infecting the machines and robots used for off-world mining operations. The game progresses through the Solar System, from the Moon to Mercury, then outbound towards Pluto's moon Charon. After defeating the boss robot on Charon, the Material Defender is informed he cannot return to the PTMC's headquarters in Earth orbit, as there is a chance his ship may be infected with the same virus as the defeated robots. His employer also mentions that PTMC has lost contact with their deep-space installations outside the Solar System, hinting at what is going to happen in the sequel. The original Descent was developed by Parallax Software for the DOS platform. Like most games of its era, the game was developed with a software renderer, because mainstream 3D graphics accelerator cards did not exist at the time. However, while most of its contemporaries—Doom included—use sprites, to render enemies, Descent renders enemies in full 3D using polygon meshes, a technique employed by Quake one year later. Sprites are used only for power-ups and the hostages. Descent's graphics engine uses portal rendering, taking advantage of the game's use of collections of cubes to form rooms and tunnels, in contrast with Doom and Quake, which use BSP trees. This system was very efficient, and made possible one of the first true 3D textured environments in a video game. On lower-end systems, detail levels could be reduced to cut out some of the smaller polygons on robots and render solid color blocks in place of textures on distant walls and across passageways in the distance. Within the game, sides of cubes can be attached to other cubes, or display up to two texture maps. Cubes can be deformed so long as they remain convex. To create effects like doors and see-through grating, walls could be placed at the connected sides of two cubes. The game also introduced an elaborate static lighting scheme alongside its simple dynamic lighting, where the environment could be lit with flares—another advancement compared to Doom. Descent II later added more dynamic lighting effects, including the ability to shoot out light fixtures. The original Descent uses indexed 8-bit color in DOS's display mode 13h with a 320 × 200 resolution. Unlike its sequel it uses only one 256-color set during gameplay rather than a unique set for each group of levels; these colors tinge red during damage and purple during fusion charging. The Macintosh and later PC versions allow higher resolutions, as well as 640 × 480. The default engine uses a software rendering in which the perspective transformation for texture mapping is only performed once every 32 pixels, causing textures to appear to pop or shift when viewed from certain angles. The software renderer also uses nearest-neighbor texture filtering, as opposed to bilinear filtering or trilinear filtering used by modern video cards. Nearest-neighbor texture filtering causes aliasing artifacts, blocky textures. These rendering compromises allowed the game to be played on most PCs contemporary with it, while better rendering techniques would have prevented it from being run on any but the most powerful gaming PCs in 1995. Due to the game's CPU burdening software rendering, the game was playable on 386 CPUs at 33 MHz and for good-quality rendering with full-screen view and better than minimal render depth, a 486 running at least 66 MHz was required. With the release of the faster Pentium, the performance requirements were no longer an issue and maximum rendering quality was possible. Descent was originally released in North America on March 17, 1995. Initially it was released by Interplay as shareware, with the full version released three months later, just over a year after the December 1993 release of id Software's Doom. On that year came the Mac OS, Acorn Archimedes and PC-98 releases as well, respectively exclusive to North America, Europe and Japan. A modified version of Descent with stereoscopic graphics was released as a bundle with StereoGraphics's SimulEyes VR 3D glasses. In 1995, a commercial Descent level editor called Descent Mission Builder, created by Bryan Aamot of Brainware was published by Interplay Productions. Users can create their own single-player and multiplayer levels with the program and then play them. Later that same year came Descent: Levels of the World, a popular add-on containing all of the entries from a level design competition held by Interplay in 1995, plus one level designed by Parallax Software. A viewer is included, allowing the player to see a preview of each map, as well as selecting ones that received a "Top 10" award or an honorable mention. In 1996, Descent: Anniversary Edition was released on the one-year anniversary of the original game's debut. The Anniversary Edition featured Descent, the Levels Of The World add-on, and several additional levels created by Parallax. A version of Descent was produced for the PlayStation in 1996. It features all thirty levels, with five new anarchy levels, the remixed soundtrack from the Mac OS version (featuring extra tracks from Type O Negative and Nivek Ogre of Skinny Puppy), prerendered cinematics (using the same cinematic engine as Descent II), and radiosity colored lighting effects. In 1997, Descent was bundled with its 1996 sequel Descent II in Descent 1 and 2 The Definitive Collection. This included Descent, the Levels Of The World add-on, and several additional levels created by Parallax. The various expansions for Descent II were also included, as was a preview of the upcoming Descent 3. In February 1996, Descent's official support ended with Parallax' last patch v1.5; therefore the game runs fine on PCs' using Windows 95, but has compatibility problems with the later released Windows XP. A Sega 32X version of Descent was announced as the first console version, but it was never released. A Panasonic M2 version was also announced but never released due to the system's cancellation. A planned Sega Saturn version was cancelled because the programmers found that a straight port of the PlayStation version was not possible, and they did not think it would be worth their while to do a more elaborate port for the Saturn. In February 1997, it was confirmed that Interplay was planning to release the game to the Nintendo 64 in time for the holiday season under the name "Ultra Descent", as it had done for the PlayStation the previous year. Throughout the next two years it was said that the game was still in development and release dates were scattered all over the place until it was silently canceled in late 1999. In 1997 on the commercial end of life the source code of the original Descent was released, excluding the audio code, which was later replaced with the Allegro library. The source code to Descent II was subsequently released in 1999. Parallax Software released the source code to the original Descent and Descent II under the terms of a non-free source code license in which that all commercial or revenue-generating distribution is restricted. It has, since then, been licensed under the GPL3. The source code availability led to the creation of Descent source ports for modern computer operating systems and hardware by the game's community. Notable examples are DXX-Rebirth and D2X-XL (with Oculus Rift support), as well as a homebrew Wii version. The trademark registration for Descent was allowed to lapse by Interplay in 2002 and was re-registered in 2008. In November 2007, Interplay announced that the company had plans to create a new Descent game if it could secure funding for the game's development. Descent was re-released on modern digital distribution services after being non-available for years in retail distribution: GOG.com, on September 9, 2008 (as part of Descent + Descent 2) and Steam on February 13, 2014, where it has met with high sales. In December 2015, Descent, Descent II and Descent 3 were withdrawn from Good Old Games. A representative of Parallax Software responded to speculation on the Good Old Games forums, regarding the withdrawal of the titles. Parallax- still in existence- owned the copyrights to the first two games, but claimed not to have been paid royalties on them by publisher Interplay since 2007. As a result, they had terminated the 21 year sales agreement, meaning Interplay no longer had permission to distribute Descent or Descent II. Descent and Descent II remained available through Steam as of 30 December 2015[update], despite Parallax's assertion that this should not be the case. However, in November 2017, GOG.com announced that the Descent series would be available for sale again on their platform. The game has also since resurfaced on Steam. Interplay originally announced that a version of Descent was planned for release on the WiiWare for the holiday season of 2010; however, while not officially cancelled, no progress has been seen in 4 years, and it is considered vaporware[by whom?]. According to Interplay, the combined global sales of Descent and Descent 2 surpassed 1.1 million copies by June 1998. Descent was a critical and commercial success. GameSpot gave the PC version an 8 out of 10, remarking that "Only one 3-D shooter adds a whole new dimension to the field: Descent." They particularly noted the labyrinthine environments and free three-dimensional range of movement. USgamer ran a retrospective feature on the game, saying it combined the genre of space flight simulator with a first-person shooter experience. Next Generation reviewed the PC version of the game, and stated that "Truly impressive graphics, smooth animation, and many loads of powerups make this a title that will keep most gamers glued to the screen for hours." The four reviewers of Electronic Gaming Monthly called the PlayStation version an outstanding conversion due to its extremely fast rendering speed and improved lighting effects. However, two of them felt that the gameplay lacked excitement. Major Mike of GamePro also judged it "an excellent conversion" due to its complex but generally easy to master controls and impressive lighting effects, though he did complain of sometimes severe slowdown. Maximum stated it "is one of the greatest games to grace the PlayStation, and rates alongside WipeOut as one of the best ambassadors for the machine." They particularly applauded the labyrinthine level design, intelligent enemy AI, and lighting effects. Their subsequent feature on the game was more critical, saying that "the official PAL version of Descent features some of the most hideous letterbox PAL borders we've ever seen, with no sign of PAL optimisation whatsoever." However, it also praised the game's use of the PlayStation link up cable. Next Generation too praised the developers for adding lighting effects and a new industrial soundtrack to the PlayStation version rather than doing a straight port. Like Major Mike, they found the controls complex but intuitive and easy to master, and while criticizing that the game can be dry and repetitive, they concluded, "Overall, you still can't go wrong, and if you've got the ability to fly against someone else, it doesn't get much better." In 1997, Interplay released Descent to Undermountain, a role-playing video game that used a modified version of the Descent graphics engine. The popularity of Descent brought about several similar six-degrees-of-freedom shooters. One of the most well-known "Descent clones" was Forsaken, which was released by Acclaim Entertainment in 1998 for PC, PlayStation, and Nintendo 64. Forsaken had similar graphics to Descent, and almost identical gameplay. Descent: FreeSpace – The Great War was released by Volition in 1998. It shared the Descent name, but otherwise had no connection to the series; it was given the "Descent" prefix to avoid trademark issues with "FreeSpace", a disk compression utility (in Europe, it was released as Conflict: FreeSpace – The Great War). FreeSpace was a space simulator, and while it was still technically a 3D shooter, it did not retain Descent's characteristic "six degrees of freedom" control scheme, save for a cheat code that would force the player's ship to loosely mimic Descent's physics. Some early drafts of the FreeSpace story had the pilot searching for Descent's "Material Defender", but the story of the finished game was unrelated. Around that time, Volition also began work on Descent 4, but development was canceled. Descent 4 may have been originally planned as a prequel to Descent, and reportedly served as a basis for the 2001 first-person shooter Red Faction. Similarities include a reference to a "humans first" strike in Descent's opening briefing, and plot points such as nanotechnology, an evil faceless corporation, the name of the protagonist (Parker), and the virus they are attempting to harness. Mike Kulas (president of Volition) stated in an interview that the Red Faction and Descent universes are strictly separate, however he did admit that code intended for Descent 4 had been used in Red Faction. Miner Wars 2081, a six degrees of freedom game released in 2012, features audio work by Dan Wentz, sound effects editor for Descent II. In 1999 the Descent series also spawned a trilogy of novels written by Peter Telep and sold at several major booksellers. The titles are Descent, Descent: Stealing Thunder, and Descent: Equinox. The novels did not follow the games to the word, but expanded on the basic premise, and were very well received. In November 2014, several former developers for the Star Citizen game, led by Eric "Wingman" Peterson announced that they were forming Descendent Studios to work on a multiplayer game similar to Descent in play style, and with the working title "Ships That Fight Underground". The company was approached by Interplay in December and a deal was struck to license the Descent name and to reboot the entire Descent franchise to Descendent Studios. In March 2015, Descendent Studios announced a Kickstarter for Descent: Underground, a new prequel using Interplay's existing IP rights to the Descent franchise (with Parallax owning the remaining IP, such as the original Pyro GX ship and music). It is powered by Unreal Engine 4 and has a planned release date of fall 2018. The game is to be released in 2019 under the name Descent. In October 2015, Sigtrap Games released Sublevel Zero, a first-person roguelike six-degree-of-freedom shooter. Inspired by gaming classics such as Descent and Forsaken as well as contemporary shooters like Teleglitch, Sublevel Zero's combat is driven by modern looting and crafting. The game started life as a jam entry for Ludum Dare 29, placing 21st of thousands of entries. In February 2016, Revival Productions announced a Kickstarter for Overload, a Descent-style "six degrees of freedom" tunnel shooter by a team containing many of the original Parallax developers who created the original Descent games to begin with. Overload, a game with a story in an original world, was released in May 2018 and is developed using Unity 5. ^ "Descent". GamePro. IDG (86): 186. November 1995. ^ a b "NG Hardware - 3DO M2 - Key Software". Next Generation. No. 12. Imagine Media. December 1995. p. 81. ^ "'Descent' at E3: The Retro Shooter Has Been Resurrected and Reimagined". 13 June 2018. Retrieved 15 June 2018. ^ a b c d e f g Parallax Software, ed. (1995). Descent Instruction Manual. Interplay Productions. ^ a b c "Descent Review". GameSpot. May 1, 1996. Retrieved 12 July 2015. ^ "Mouselook - An Objective Look". descentbb.net. ^ Parallax Software (1994). Descent. Interplay Productions. Level/area: Mars Military Base. ^ Parallax Software (1994). Descent. Interplay Productions. Level/area: Oberon Platinum Mine. ^ Parallax Software (1994). Descent. Interplay Productions. Level/area: Nereid Volatile Mine. ^ Kaufeld, John (1998). Games Online for Dummies. IDG Books Worldwide. p. 42. ISBN 978-0764504341. Retrieved November 20, 2012. ^ a b Parallax Software (1994). Descent. Interplay Productions. ^ Parallax Software (1994). Descent. Interplay Productions. Level/area: Charon Volatile Mine. ^ "Descent (1994) DOS release dates". MobyGames. ^ "Quick Hits". GamePro. No. 89. IDG. February 1996. p. 17. ^ "Descent: Levels of the World". GamePro. No. 90. IDG. March 1996. p. 44. ^ "Descent patch 1.0 to 1.5 (registered) - The Patches Scrolls Downloads". patches-scrolls.com. ^ "Interplay Technical Support page, Descent". Interplay Entertainment. ^ "Descent". Electronic Gaming Monthly. Ziff Davis (69): 88. April 1995. ^ "Cutting Edge - 3DO buoyant as M2 picks up speed - M2 launch software". Edge. No. 23. Future Publishing. September 1995. p. 7. ^ "Descent Is Sent Down". Sega Saturn Magazine. No. 14. Emap International Limited. December 1996. p. 8. ^ "Descent N64 Announcement". nesworld.com. ^ "Descent N64 Update September 1997". IGN. 25 September 1997. ^ "Ultra Descent Preview". n64paradise.tripod.com. The N64 Universe. ^ Dunkin, Alan (1998-01-26). "Descent Source Code Released". GameSpot. Retrieved 2013-01-13. Parallax Software, the software developer that created the popular three-dimensional action games Descent and Descent II, has released Descent's source code (version 1.5) to the public domain for noncommercial purposes. ^ "Descent 3 - Past Headlines - 1999". Outrage Entertainment. Archived from the original on 2007-02-03. Retrieved 2007-02-07. ^ Beckhaeuser, Christian. "Details & History". dxx-rebirth.com. ^ Mali, Dietfrid. "D2X-XL". descent2.de. Retrieved 11 September 2016. ^ "USPTO entry for the Descent game trademark". ^ "USPTO entry for the Descent game trademark (2008)". ^ Sinclair, Brendan (2007-11-13). "Interplay restarting dev studio". GameSpot. Retrieved 2014-01-17. ^ "Q&A: GOG.com's DRM-free downloadable games". GameSpot. September 8, 2008. GOG.com's Interplay catalogue--which includes classics like the Fallout series, MDK 1 and 2, the Descent series, Messiah, Giants: Citizen Kabuto. and Sacrifice. ^ "Descent Video Game on Steam". store.steampowered.com. Valve Corporation. Archived from the original on December 5, 2014. Retrieved December 7, 2014. ^ "Interplay". interplay.com. Retrieved 2017-11-30. ^ "Interplay". www.facebook.com. Retrieved 2017-11-30. ^ a b "Descent 1+2 & Descent 3 - Removed From Sale, page 10 - Forum - GOG.com". www.gog.com. Retrieved 2015-12-30. ^ "Welcome back Descent series!, page 2 - Forum - GOG.com". www.gog.com. Retrieved 2017-11-24. ^ Wahlgren, Jon (15 April 2010). "Interplay Straps In with Descent for WiiWare". Nintendo Life. ^ Interplay Entertainment Final Prospectus (Report). Irvine, California. June 22, 1998. p. 36. Archived from the original on February 26, 2017. ^ Bennett, Dan (May 1995). "Descent". PC Gamer US. Archived from the original on November 15, 1999. ^ Vox Day (June 1995). "Vertigo to the Third Degree". Computer Gaming World (131): 104, 106, 108. ^ LeVitus, Bob (June 1996). "The Game Room". MacUser. Archived from the original on February 25, 1999. ^ Ryan, Michael (August 1995). "360° of War". PC Magazine. Archived from the original on April 17, 2001. ^ DeLisio, Fred (April 1996). "Descent 1.0". Macworld. Archived from the original on August 9, 1997. ^ a b "Finals". Next Generation. No. 5. Imagine Media. May 1995. p. 92. ^ Parish, Jeremy (March 16, 2015). "Revisiting Descent, the Most Literal Interpretation of "3D Shooter"". USgamer. Retrieved 12 July 2015. ^ a b "Review Crew: Descent". Electronic Gaming Monthly. Ziff Davis (80): 30. March 1996. ^ a b "Maximum Reviews: Descent". Maximum: The Video Game Magazine. Emap International Limited (5): 154. April 1996. ^ a b "Descent". Next Generation. No. 17. Imagine Media. May 1996. pp. 90–91. ^ "ProReview: Descent". GamePro. IDG (91): 66. April 1996. ^ "Descent: Interplay's 3D Classic on PlayStation!". Maximum: The Video Game Magazine. Emap International Limited (6): 68–70. May 1996. ^ "Descent to Undermountain: The Flame Sword of Lloth". Next Generation. Imagine Media (11): 130–1. November 1995. ^ "Unofficial Freespace FAQ — Why is it called "Descent"?". freespace.volitionwatch.com. Archived from the original on July 16, 2011. ^ "Asrale's Volition Interview". planetdescent.com. IGN. 2000-09-11. Archived from the original on 2010-01-20. Retrieved 2012-05-15. ^ "Descent (Book 1) Mass Market Paperback – January 1, 1999". Amazon.com. Retrieved 11 September 2016. ^ Ed, Citizen (2014-11-07). "Wingman's New Hangar and Crew". Citizen Star News. Retrieved 2014-11-29. ^ "Descendent Studios Ep2". Wingman's Hangout. YouTube. 2014-11-14. ^ a b Studios, Descendent (2015-03-11). "Descent: Underground Kickstarter". Kickstarter News. Retrieved 2015-03-11. ^ Matulef, Jeffrey (10 March 2015). "Descent is being rebooted on Kickstarter. Adds team-based multiplayer to the disorienting space combat series". Eurogamer. Gamer Network Ltd. Retrieved 24 March 2015. ^ "Sublevel Zero Redux on Steam". store.steampowered.com. ^ "Ludum Dare 29 - Ludum Dare". ludumdare.com. ^ "OVERLOAD - The Ultimate Six-Degree-of-Freedom Shooter". Kickstarter. ^ "Frequently Asked Questions - Overload". This page was last edited on 27 March 2019, at 18:44 (UTC).